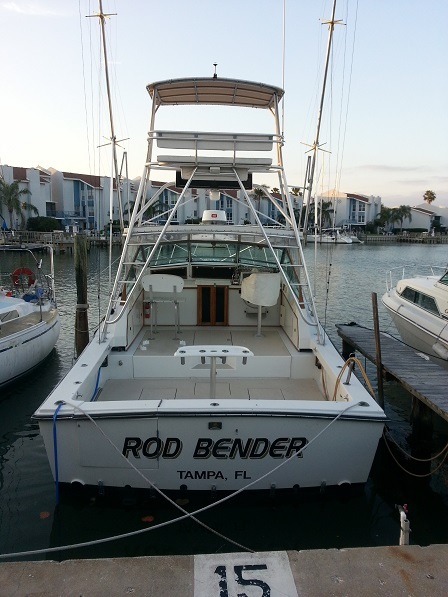 Johns Pass Fishing Charters of Madeira Beach offers the ultimate offshore fishing experience. We offer private charters for up to 6 passengers aboard our 34 ft Topaz Express. Whether it’s fishing or just a nice day out on the water site seeing, John’s Pass Charters can offer you a safe and enjoyable experience. The Gulf of Mexico offers some of the best fishing in the world. From Red and Gag Grouper, Red and Yellow Tail Snapper to King Fish, Cobia and Sharks, Johns pass charters can put you on the fish. We offer charters for all experience levels so bring the kids. John’s Pass Charters offers private charters for up to 6 passengers for 1/2 , 3/4, full day and extended day trips. We also offer echo sightseeing tours for those looking for a nice day out on the water. Our boat “Rod Bender” is a 34ft Topaz is nicely equipped with all the safety equipment and plenty of shade to keep you cool. The cabin is equipped with comfortable seating and an enclosed bathroom. Copyright © 2019 Johns Pass Fishing Charter. All Rights Reserved.